Not only is handlooming important because of its cultural connotations, it also plays a vital role in the country’s economy, because it is the second largest economic activity after agriculture. 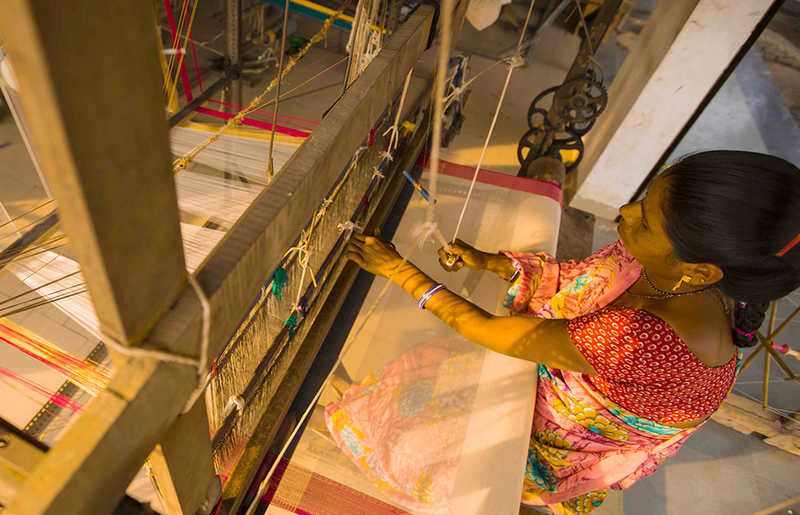 As one of the most important industries in India, working with handlooms has provided employment to at least 4.3 million people (according to the 2009-2010 consensus). There are essentially production hubs scattered along the length of India, and each specializes in a particular type of textile production. Ludhiana in Punjab, for example, is considered the center for manufacturing wool textiles, while Coimbatore creates those made of cotton. And although nobody in the country wears hosiery, Tiruppur in Tamil Nadu is the main producer, and creates the material primarily for export. By giving direct and indirect employment to millions, and accounting for more than half of all hand woven material produced in the world, this tradition is more impactful than one would think. The production of fabrics by hand not only allows for the weaver’s ability to shine, but also ensures that the end result is clothing that was created sustainably. In lieu of searching for cheaper production options, or sacrificing quality for quantity, there are a number of designers who are taking a similar ethical approach to their work by employing those who have the skill it takes to create works of art, all while keeping traditions alive. Injiri itself translates to “real India”. Established by textile designer Chinar Farooqui in 2009, the label expresses her appreciation for the traditional Indian textile techniques. By designing all of her items alongside weavers who who work with wooden handlooms, her textile design is the most significant feature in her products. By working from her studio in Jaipur, Farooqui has developed a network of handloom collectives that spread from Gujarat to West Bengal. And although Lisa Corti is not entirely focused on handlooming, it is a brand that produces their work directly from India. By keeping the manufacturing process contained, they are preserving traditional methodologies and ensuring that their work is quality through every step. Trivandrum is the first stop on their journey, as this is the area that they manually weave their fabric on wooden looms. This is a process that has remained unchanged over time, and is so characteristic that there are large cooperatives of women who specialize in it. From there the garment travels to Jaipur, which is where they have perfected woodblock printing by hand. The blocks are engraved by chiseling craftsmen who produce the desired designs, and the number of blocks required for a print depends on the number of colors in the design, which means one of their pieces could require as many as six different blocks. After they are completed, the blocks are dipped in the dye, and pressed one by one, into the fabric until the design is complete. Péro also creates their work from start to finish within India. Their garments move as they are handloomed, hand dyed, hand embroidered and finished off with details that require exquisite attention. As a whole, Aneeth Arora genuinely cares about craft and extending a sense of community or an authentic connection, to the people who wear Péro. Neeru Kumar is just as invested in the meticulous care that their home goods go through. 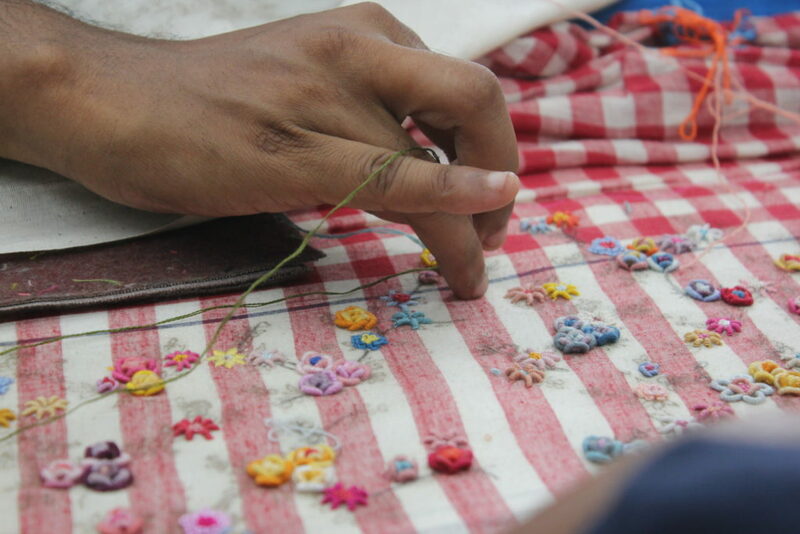 Designs that are handloomed take precedence, in addition to hand embroidered details. 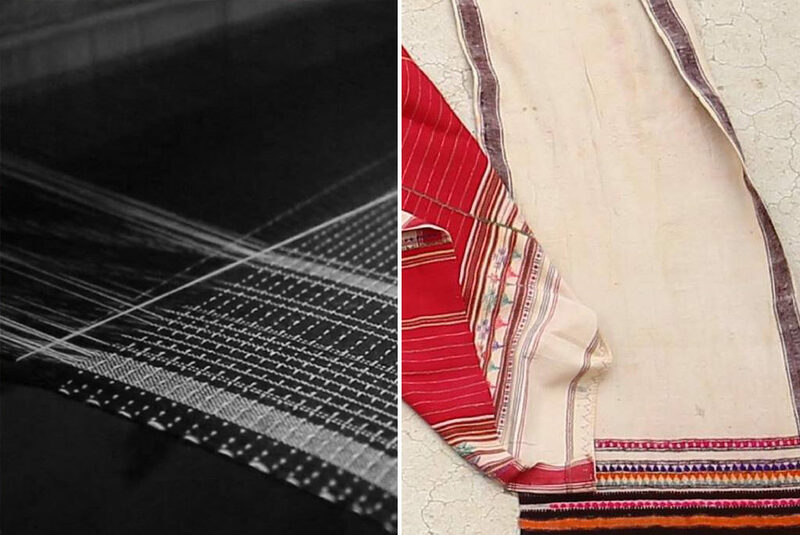 Classified as a textile genius, Neeru Kumar produces her work with indigenous materials and crafts, shining a spotlight on many forgotten techniques and fabrics, especially kantha, ikat and khadi. It’s easy to see why people take a liking to the work these brands produce, as they are authentic, and thoughtful in all of the right ways. It is safe to say that humans have been weaving cloth for centuries, thanks to evidence indicating that it was practiced as early as the Paleolithic era. Handlooming however, has a complicated history and it is hard to place exactly when it came to be. Some state that weaving traveled to Ilkal near the 8th century A.D., around the time that the Chalukya Dynasty was in full swing. In the years since, it has become a traditional textile art within India, thanks to the production of saris, as each region of India contains their own design techniques that are characterized by specific motifs and colors. At a small town named Chanderi in Madhya Pradesh, these saris were established at the heart of the country. Madhya Pradesh is known for its historical significance, as well as being a world famous center for weaving in the 2nd century BC, rising to prominence in the 11th century when it became the most important trade route in India. This was due to its proximity to the routes leading to ancient ports of Gujarat, Malwa, Mewar, and Central India regions. Records show that those who used handlooms ultimately wove Chanderi saris for royalty between the 12th and 13th centuries. There are statements by Maasir-i-Alamgir (1658-1707), ordering the use of a cloth embroidered with gold and silver for making khilat (a ceremonial robe or other gift given to someone by a superior as a mark of honor). The reason many found this fabric so attractive, was due to its softness, transparency, and the fringes embellished with heavy gold thread embroidery. Because of all these qualities, these saris were often called “woven air”. Most often, their motifs consisted of peacocks and other animals, lotuses, celestial figures, geometric patterns, and artistic lines intertwining one another. Chanderi fabric was also exported overseas. At the time, “throw shuttle pit” looms were in use, and weaving with this was laborious, requiring two weavers work together on the same loom. In a throw shuttle loom, the shuttle is taken across the shed (or the warp threads) by hand. Typically now, only fly-shuttle looms are used and operated by a single weaver, as it is easier and nearly triples production. Before fly-shuttle looms, a person could only work on fabric as wide as their arm span would allow. Maheshwari saris get their name from Maheshwar, a city in Madhya Pradesh, which became a center for handloom weaving around the 5th Century. Maheshwar was the capitol, enjoying an elevated status until January of 1818. It was thanks to the demand from the royal family as well, that the Maheswari sari came to be. According to legend, Rani Ahilya Bai Holkar employed craftsmen from Surat and Malwa to design a sari that would be gifted to her visiting relatives and guests. The first sari was designed by her highness, and Maheswari saris soon became popular in the royal circle, and eventually with women of all ages and statuses. Two types of handlooms are most often used in Maheshwar — pit looms which are heavy and fixated, and more recently, lightweight metal frame looms. Pit looms are positioned over concrete holes in the ground where the weaver sits so they are level with the loom, and the paddles are also located in the ground as well. This both conserves space because other looms can be quite large, and is said to help retain moisture and make the quality of the fabric better. Once yarn is dyed and untangled, it is given to the weavers in bundles correlating to the warp and the weft, and separated by a spinning wheel into rolls. Aside from saris, Maheshwar fabric is often used for kurtas, shirts, stoles and dupattas. 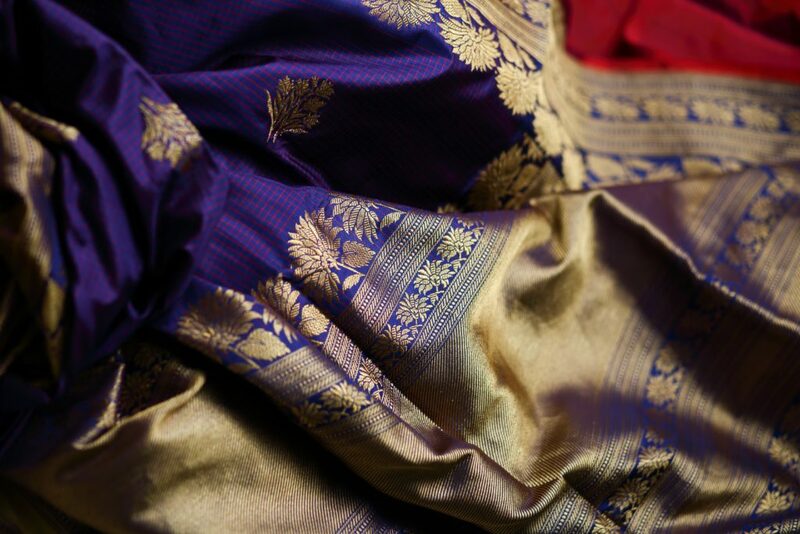 The most decorative part of a Maheswari sari is often the pallu (the end portion of a sari), which is typically designed with bright colors like magenta, green, and violet. It is also distinct with multiple stripes which alternate. The borders are reversible, so it can be worn showing either side. In terms of motif, Maheswari saris typically feature checks, stripes and floral borders. Pochampally ikat saris are made with a form of silk that comes from Andhra Pradesh, in Bhoodan Pochampally. Often dubbed the “Silk City of India”, this town is known for producing a fabric that is difficult to rival. Additionally, Bhoodan Pochampally created history, becoming a silk mine in the 18th century. The process of weaving Pochampally ikat saris is said to have originated in a town called Chirala, where the art was often called chit-ku, and praised for its unique design. These silk saris blend comfort with grandeur perfectly. Often a geometric pattern can be found spreading across the entire garment, and a characteristic of ikat saris are the “blurriness” to the designs, which is a result of the weaving difficulty and dyeing process. Ikats with little blurriness, multiple colors and complicated patterns are more complicated to create and therefore more expensive. 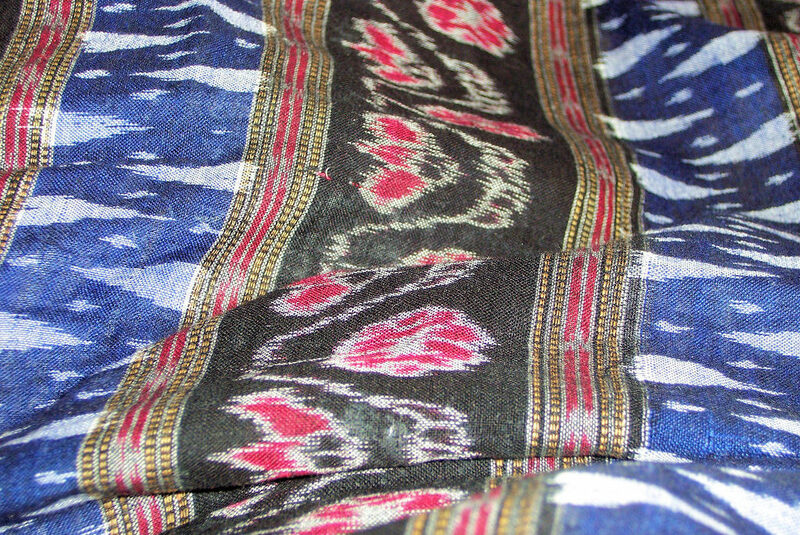 However, this blurriness is so characteristic of an ikat, that it is prized by textile collectors. Typically, ikats come in two forms: a single ikat where only the warp is dyed and interwoven with the weft, which is uncolored or is a basic shade, and double ikats where both warp and weft are dyed and positioned in a way that creates a design with bleed. Pochampally works with double ikat, boasting numerous intricate geometric designs. 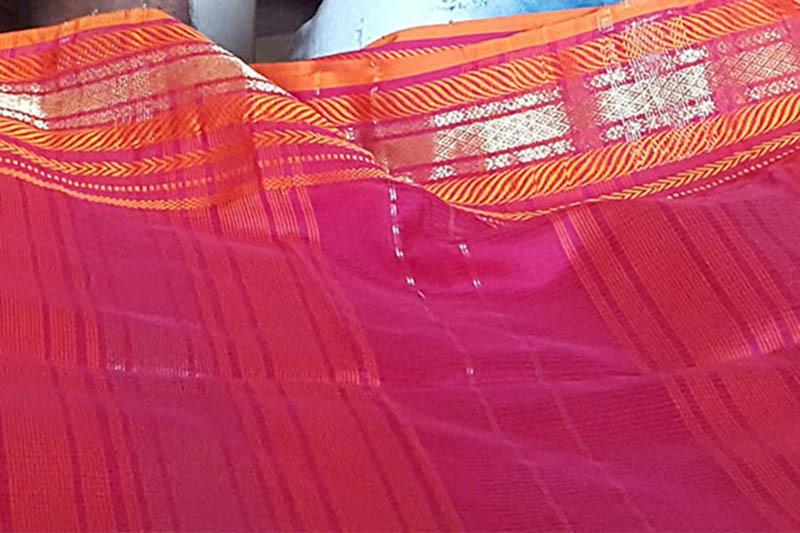 A single Pochampally ikat sari takes a family of four people ten days to weave, and takes place not only in Pochampally but also Chowtuppala, Srirpuran, Chigottala and Galteppala as well as a few other villages.